Excavation is nearing completion. A lot of mud with rock at the bottom which is about as good as you can get for around here. 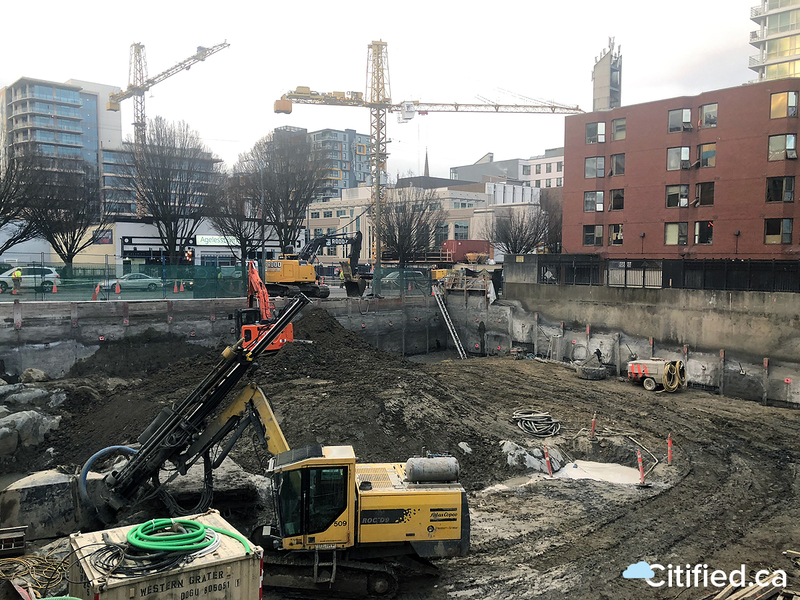 In fact, if you look at the crevasse they've uncovered it looks like it could very well be the remains of the legendary Johnson Street ravine. You should check it out. They should have asked for something that would partly or fully obscure 844 Johnson and its effects from the rest of us. Oh wow, no kidding. I’ll have to check that out. What’s the estimated completion for this project? Any other updates? Also how many floors & units will there be? That’s up to date? The photo is of one of the previous renderings is it not?? I suspect blasting will start here soon if it already hasn't. Thread thumbnail pic has changed for this? Do we have more images? edit: from the October, 2018 revisions doc. So these are the best images we've seen so far, yes? 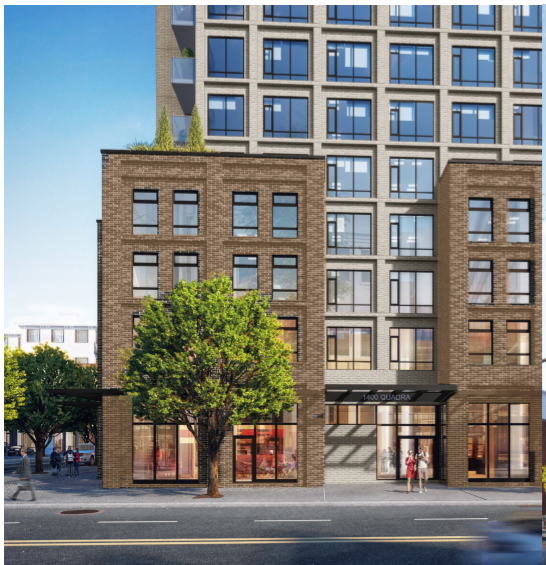 I'd say the design seems to come together much better when you can actually discern the texture of the lighter brick veneer. There's actually a lot of glass coverage on this building, too. Edited by aastra, 02 February 2019 - 12:11 PM. Are there plans to remove to overhead power lines on Johnson & Quadra, or was that just taken out of the renderings to make them look nicer? IIRC OH power lines are still on that block of Yates, but I hope so. Hopefully! 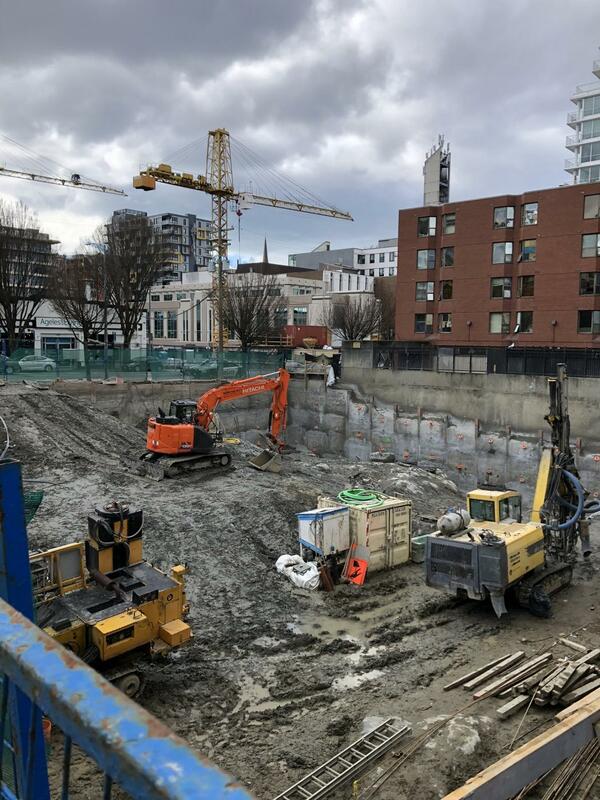 I know that in Richmond pretty much every new development is required to either underground their lines or pre-duct for undergrounding in the future. How much deeper are they going? When do you figure they’ll start pouring concrete?? 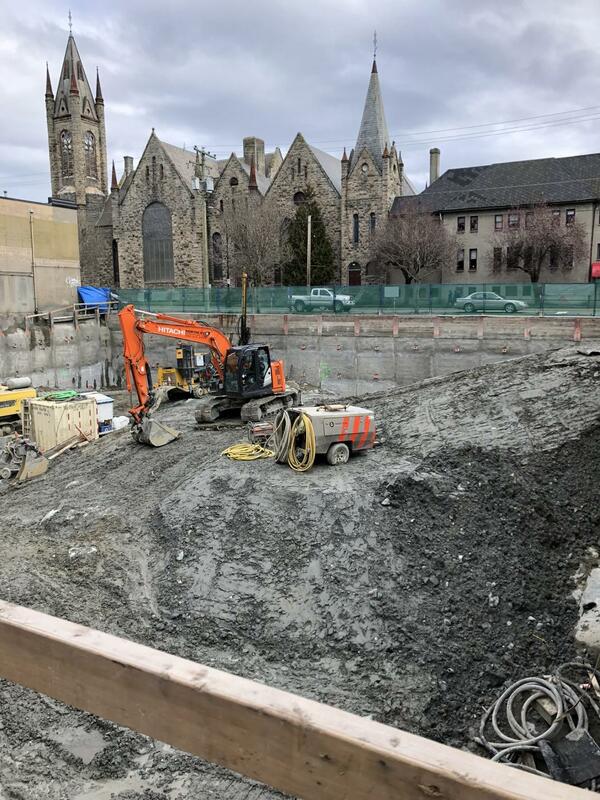 I walked past this site earlier today and I suspect the western side of the excavation may be nearly complete, but the SE corner and some of the eastern side will require blasting. I think it will be a while before the first concrete is poured here (shotcrete reinforcements notwithstanding). 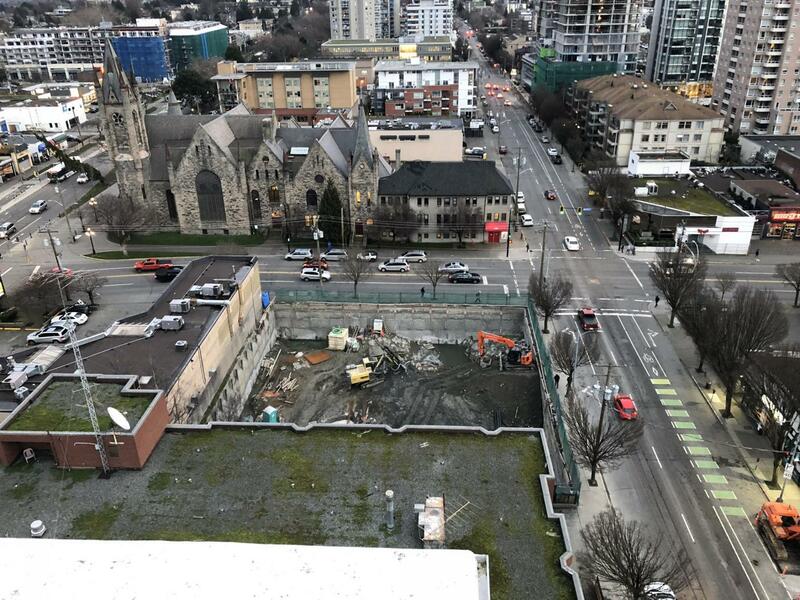 Edit: I just took another look at Marko's last photo above and clearly there will need to be some blasting and rock removal more towards the western side as well. Edited by Nparker, 25 February 2019 - 05:18 PM. They've got a heck of a long way to go. This thing has a four level underground parkade (bottom level is split, so about 3.5 actual levels below ground, plus the necessary footings below that). My guess is they won't start pouring concrete, provided everything goes well, until late June or early July. I feel bad for those people who bought at 834.. on paper had all the makings of a good investment(in presale, many moons ago).. downtown, concrete, reputable builder. But the combination of the questionable location, the run down feel (especially in the lobby), and now with this building causing some major loss of views, buyers there must of lost big time (when looking at other comparables)! Plus throw in the fact both elevators are going to be down for who knows how long with massive repair bills on the way, I would hate to be a tenant let alone an owner! Edited by Rulon, 25 February 2019 - 07:27 PM. I don't know. Once Vivid and this are done. I think that there will be a lot of locals that will not be so positive about how the facility there is being run. It can't go on like that indefinitely. At some point this is going to be vibrant downtown neighbourhood and prices of the condos will reflect that.